Christ has died. Christ is risen. Alleluia! ‘Christ rose for us’. With a more positive theology, the balance is being restored and emphasis is once again on Resurrection. Second reading Colossians 3: 1-4. Paul, with his deep insight that by creation and by baptism we are ‘in Christ’, can say: ‘ you have been brought back to true life with Christ’. Christ is risen not only for us but as us. We are one with Christ so Paul can say: ‘we have died with him and now live the risen life with Christ in God’. We and our real lives are far more wonderful than we could ever comprehend or imagine. He is our life. 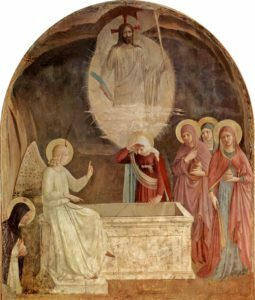 The Resurrection is at the very core of our being. Very early on the first day, not only of the week but of a new era, it was still dark. Mary is in the dark. Her world is very dark but she comes to the tomb, drawn by love and longing. This is where her heart is, wherever he is. She is disturbed to see the stone moved. She looks in seeking him but sees he is not there. It is significant that, in John’s account, unlike the other post-Resurrection stories, she does not go and find ‘the Twelve’ or ‘the disciples’. They are scattered in fear. 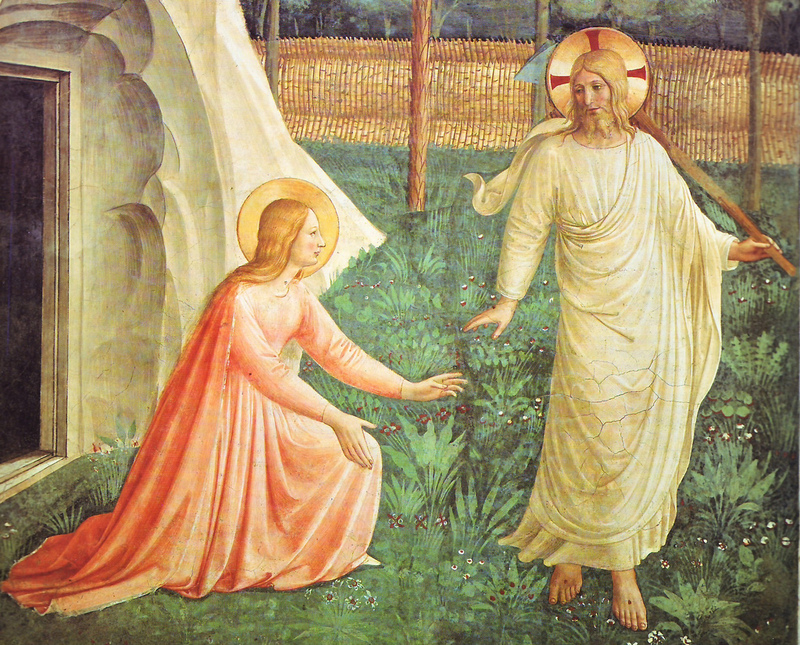 She finds Peter and the beloved Disciple who ‘come out’ – of hiding – and go to the tomb. Peter, impetuous as usual, goes right in, sees how the clothes are but no body. The other disciple then goes in, sees and believes. Where comprehension fails, love understands and believes. I am always struck by the bathos of the final sentence of this passage (omitted in the lectionary). It must be the most anti-climactic sentence in the scriptures: ‘Then the disciples went back to their homes’. The next sentence by contrast says that Mary stayed. Love held her there so she encountered the risen Christ and became his first witness.